Why not enter our photographic competition? The Terenure Residents' Association is holding a photographic competition with 2 prizes of €50 vouchers, 1 for adults (16 and over) and 1 for under 16s. The theme is "Terenure" and the competition is open to all our residents (that is if you live in the area shown on this map). There are more details about entering here. We would love to see your pictures of Terenure, so get those cameras out and Good Luck! At 8 o'clock this morning, Thursday 12th December, Terenure's latest store opened its doors for the first time. Lidl is welcoming new customers with various promotions, although one of the biggest attractions is free parking in the village for up to 3 hours. It is also nice to see some open space and planted areas around the tree on the Rathfarnham Road. Please note that several pay-and-display spaces on Beechlawn Way between the Rathfarnham Road end and the entrance to a private residential car park were finally removed on 10th December 2013. A small number of pay-and-display spaces remain further up Beechlawn Way, closer to the entrance to St Joseph's. 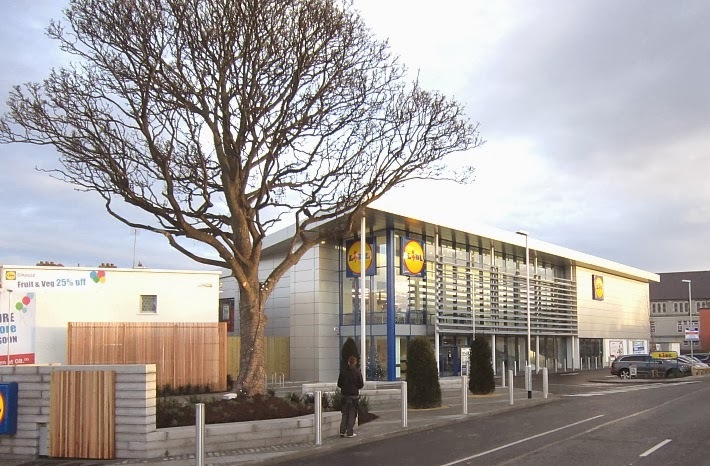 Double yellow lines have been painted on Beechlawn Way at the Rathfarnham Road end and the road has been widened to facilitate access to the car park at the new discount store. The Lord Mayor of Dublin, our local councillor Mr Oisin Quinn, will turn on the lights at 6pm, followed by a reception in the adjacent Evergreen Hall. Come and enjoy this great night for all the family. The sale is in aid of Phakamisa.